Two great interactive learning games which can be used on the network or on an interactive whiteboard. Free to download and use today, both of these games have been thoroughly tested in classrooms and you will be amazed at how effective they are for enhancing student knowledge! Part quiz game, part snakes and ladders, this new interactive learning game from What2Learn is a fun yet powerful revision tool. Played in pairs or by dividing the class into two teams, students must answer multiple choice questions. Answering quickly will increase help to roll higher scores. Once you have downloaded this game engine, you can add your own questions quickly and easily by editing the supporting text file. This fantastic learning tool has been produced as a thank you to anybody who follows What2Learn on Facebook. 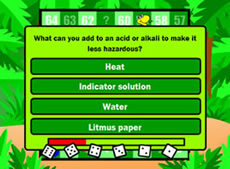 Download the game for free now by going to the What2Learn Facebook page and selecting ‘Like’ on the welcome page. 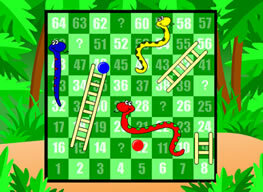 Play an example snakes and ladders quiz game here. We have updated our Celebrity Death Match game with a number of the latest major celebrities. This is a fun and effective game to play with whole classes and can be used in any subject area. This can be played on an interactive whiteboard, though it can be played in any classroom with a digital projector. Be prepared for a noisy time as your students battle it out to see who will win, but by the end your students will probably all know the correct answers to all of the questions in your game. You can also download this game for free now by going to the What2Learn Facebook page and selecting ‘Like’ on the welcome page. A webpage is instantly created with your game allowing it to be played online anwhere. Use automated monitoring of the scores your students get. Embed your completed game into a blog, VLE or PowerPoint presentation.